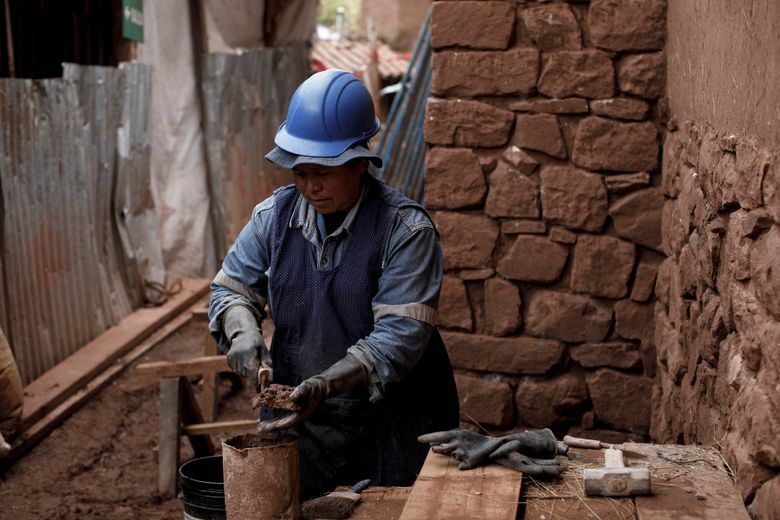 High in the Andes Mountains, in Peru, conservators are testing traditional methods for strengthening adobe buildings. In Kuño Tambo, perched at 13,000 feet in Peru’s Andes Mountains, the mud-brick walls of the Church of Santiago Apóstol, built by the Spanish in 1681, have weathered their fair share of earthquakes. But after more than three centuries of shaking, the church began the 21st century with eroding bricks, walls coming apart at the seams, missing buttresses and a tattered, leaking wooden roof. Murals on the interior walls were flaking off, and the free-standing bell tower across the village’s central plaza had acquired a crazed, Seussian cant. The church had become too unsafe to hold regular services, a blow to this staunchly Catholic town. Kuño Tambo wasn’t alone. Strong earthquakes in 2007 and 2009 killed hundreds in Peru and ravaged scores of historic adobe structures. The danger to these buildings and the people living around them has motivated conservators and architects to explore methods to keep the buildings intact. 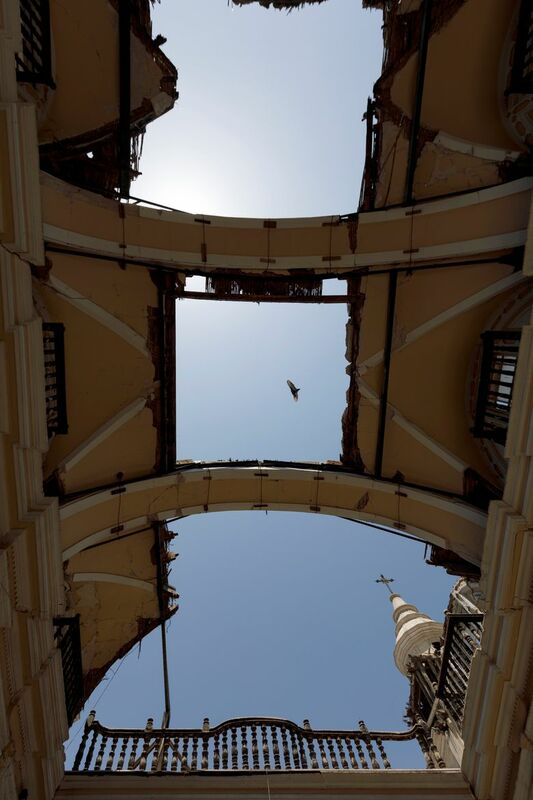 The Seismic Retrofitting Project, an initiative of the Los Angeles-based Getty Conservation Institute, is studying traditional practices for stabilizing structures in areas prone to earthquakes. Through a yearlong series of workshops in Kuño Tambo that wrapped up in August, the Getty team worked with members of the Quechua-speaking village to implement low-cost and low-tech repairs that they hope could be standardized to make adobe structures safer and more resilient. If these techniques prove effective and affordable at the Church of Santiago Apóstol and a few other sites, this approach could be used to strengthen buildings all over the world. Adobe mud bricks are one of the world’s most commonly used building materials. An estimated 30 percent of the global population — from Africa to India, and even in parts of Europe — resides in earthen structures. In Peru, where adobe has been used since before Incan times, millions of people live in residential stock made of earth. But many of the zones around the world where earthen architecture is prevalent also happen to be seismically active. Though sturdy, heavy and insulating, unreinforced adobe is prone to crumbling in an earthquake — walls twist out of alignment, crack into large chunks, then batter themselves to dust before suddenly collapsing. And damage accumulates over time; that a building survives one earthquake is no guarantee it will make it through the next. These qualities have given adobe a bad rap. The largest number of deaths from Peru’s 2007 earthquake occurred in an adobe church, where the walls failed after being battered by a concrete-bolstered structure over the front doors. It collapsed onto more than 100 panicked people as they attempted to flee. That doesn’t mean adobe will no longer be used, conservators say, or that existing structures shouldn’t be adapted to make them safer. At Kuño Tambo, conservators saw an opportunity to rigorously test traditional seismic retrofits and provide evidence of their effectiveness. Santiago Apóstol was architecturally pristine, essentially the same as when the Spaniards built it, said Claudia Cancino, the Getty’s lead on the project. This meant the building’s materials and structure could be studied without the interference of modern adaptations, making it an ideal baseline to lab-test and model the behavior of historic reinforcements. If successful, the techniques could be rapidly applied to hundreds of similar buildings in this region alone. To come up with a strategy for strengthening Kuño Tambo’s church with a mix of new reinforcements, Torrealva and a team of engineers ran over 300 small-scale physical tests of a handful of techniques used for centuries by Peruvian builders. Then, working with Paulo Lourenço, an engineer at the University of Minho in Portugal, the team built a detailed virtual model of the church. They ran simulations of the building with different arrangements of reinforcements, under multiple kinds of seismic stress. That resulted in a plan to outfit the church with 11 new tie beams that span the building’s width, a new collar beam below the roof’s circumference and three L-shaped braces called keys inserted into each corner to tie the walls together, all from regionally sourced eucalyptus wood. Along with refreshed stone foundations, new adobe bricks, three new buttresses and a new A-frame roof, some parts of the church and the bell tower were also wrapped in a nylon-like mesh and then covered with mud plaster for extra support. The mural paintings have also been the subject of their own conservation process; many churches across the region host similar artworks. As the conservation was carried out at the church over the last year, the Getty team also ran a series of intensive training workshops at Kuño Tambo to put this knowledge into the hands of the village’s residents, as well as other Peruvian conservators and engineers. The entire project cost around $1.5 million, and nearly doubles the church’s seismic resilience — well exceeding Peru’s building code standards, Torrealva said. Work at another heavily damaged building, the Cathedral of Ica, kicked off in September, and training workshops are scheduled to begin in May 2019. Speaking through a translator by telephone, a Kuño Tambo resident, Raul Cárdenas, 57, said his entire village is eager to have the church back; villagers also plan to use restoration tricks from the project to better maintain their own adobe homes. For instance, one technique involves using the gel of a local species of cactus to make mud plaster more water-resistant. And five weddings are already planned to coincide with the bishop’s visit to rededicate the church in early 2019.